Disgraced former Ill. Governor George H. Ryan got some more bad news this afternoon. A judge in Chicago ruled that the Kankakee Republican is not entitled to one penny of his pension--which until his conviction last year was $197,000 a year. Ryan's attorneys, among his team is another former Illinois governor James R. Thomspon, were attempting to get part of Ryan's pension, about $65,000 a year worth which goes back to his time as a county official and state representative, into the hands of Ryan and his wife. That's not going to happen--pending appeals of course. It's believed that Ryan has no other income--and his only major asset is his Kankakee home. Crime has not paid for George H. Ryan. Well, call it an "almost cicada sighting." What's pictured is the molted skin of a nymph cicada. This bug emerged from the ground probably early today near my home in Morton Grove. Soon millions of the insects will swarm the skies in the Chicago area. The nymph has spent the last 17 years underground, feeling of tree roots. In the next two weeks, it'll joined by million of other cicadas. They'll breed, the females will lay their eggs in narrow tree branches, then they'll die. Shortly thereafter, the eggs will hatch, the young nymphs will fall to the ground, and 17 years later they'll emerge. It's a real circle of life. Cicadas are loud--in fact they're the loudest of all insects, their wail reaches 90 decibels. The Chicago area will be a buggy--and loud--place in June. 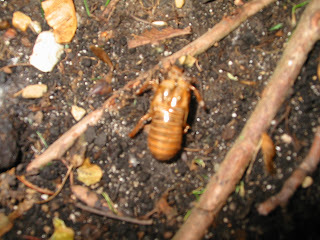 UPDATE June 1: Mark at WindyPundit was in the southwest suburbs, and the cicadas are more abundant there. He has pictures. I've been noticing a new trend in the last six months. Little dogs being carried into places such as retail stores with very clear "No Pets Allowed" signage. There's the future jailbird with her pet chihuahua, Tinkerbell. I'm not against dogs per se, but Paris emulators, forgive me for being blunt, but "Can't you read?" Going out on a limb, I'm going to state--without doing research--that Tinkerbell won't be allowed into the Los Angeles County Jail. After two terms in office, Latvian President Vaira Vike-Freiberga is stepping aside, and today the Latvian parliament elected a new president, surgeon Valdis Zatlers. Since Mrs. Marathon Pundit is from Latvia, I follow events there closely. Vike-Freiberga was a multi-lingual psychologist who spent most of her adult life as a Canadian academic. She was a candidate to replace Kofi Annan as UN General Secretary. Latvia has a small number of troops serving in Iraq and Afghanistan. Valdis Zatlers comes with significant baggage. He's a former Soviet Communist Party member, and has admitted accepting "gratuities" from patients he treated. Doctors are very poorly paid in the Baltic nation, and such side-payments are common, if not a sleazy way to supplement one's income there. Latvia's northern neighbor, Estonia, has been feeling the brunt of Russia's ire in the way of riots by ethnic Russians there--which may have been orchestrated from Moscow--as well as cyber attacks very likely directed from there. Having its own large Russian minority, relations between Latvia and Russia have been chilly since Latvia won its independence from the Soviet Union a few months before the dissolution of that nation. However, a border dispute between the two nations was recently resolved--in Russia's favor. Mrs. and Little Marathon Pundit will be traveling to Latvia in July. I've been there a couple of times before, but there is too much going on at work for me to break away for more than a week. She will be taking blog-related photographs while there. Yes, Al Gore, who had a lackluster record as a student at Harvard, and flunked out of Vanderbilt University's divinity school, and then attended Vanderbilt's law school, where he didn't earn a degree, is a genius. Just ask him. Or check with the Washington Post's Dana Milbank, who seems to have fallen in love with intellect of the former vice-president. Reading his column, I'm surprised Milbank didn't tell us that he dropped his pants during the Gore speech in Washington he reported on. 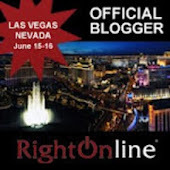 Pam Meister knows better, as she notes on her blog. But the Gore-gons who attended the speech, and Milbank, believe Gore is too smart to be president. I'm not convinced that he's even smart, let alone too smart to run the nation. One of the major international business stories is the upcoming sale of LaSalle Bank, a longtime Chicago institution. The LaSalle Bank, part of the Dutch ABN Amro financial group, owns the Chicago Marathon. Great Britain-based Barclays PLC wants to buy ABN Amro, but part of the deal is that LaSalle is to be split off and sold to Bank of America. But the Royal Bank of Scotland, known in the USA as RBS, has initiated a hostile take over of ABN Amro--including LaSalle Bank--and the Chicago Marathon. Meanwhile, the Morton Grove branch of LaSalle pictured here sits quietly--awaiting new signage once the deal is settled. And that might not be until July, since the Dutch Supreme Court will rule on whether ABN Amro shareholder can vote on the RBS bid. And as I do every year, I'll be entered in the LaSalle Bank Chicago Marathon. If RBS wins out, my guess is the LaSalle name will stick--with an RBS prefix. In a story that's getting a lot of attention everywhere in the world--except in Chicagowhere the trial is taking place--the prosecution this afternoon has rested their case in the Conrad Black racketeering trial. One count, a money laundering charge, has been dropped by the prosecution. As I noted in an earlier post, Dominick Dunne and Mark Steyn are among the big-name writers in Chicago covering the trial of the former head of the Hollinger media empire. Newspapers that were part of the chain included the Jerusalem Post, Canada's National Post, the London Daily Telegraph, the Chicago Sun-Times, and the Morton Grove Champion.